Excuse Me, Is That A Poleaxe In Your Back? I’m often asked by friends to give my thoughts and recommendations on various MMOs. Usually this isn’t too difficult. Having played so many different online games over the years, it’s easy for me to assess a game’s strengths and weaknesses. What I find more difficult to quantify is the game that has all the right elements, but somehow loses its appeal over time. This is often caused by something that should be completely inconsequential. I call this phenomenon the Niggling Pixel Effect. Does your eyebrows EXACTLY match your hair? I originally wrote about Alganon back in December. Although the developers have since revamped the UI and some of the other art assets to make it look less like a WoW clone, the overall game play remains pretty standard MMO fantasy fare. Which, in and of itself, is not necessarily a bad thing. Aside from the usual glitches and bugs that plague every new MMO, it is a solid, palatable game. Since Alganon is free-to-play after its initial purchase, I’ve spent the past 6 months leveling up a cleric. At first I found the game to be a pleasant, snack-like diversion, similar to that bag of Doritos you grab from the vending machine in the middle of the afternoon. It’s the type of game you play when you can’t (or don’t want) to pay for a subscription to the full course meal of a ‘real’ MMO. But as I progressed through the first ten levels, I found that my desire to play the game was steadily decreasing. It was then that I realized that I was suffering from the Niggling Pixel Effect. First it was my avatar’s face. Apparently designing attractive human faces in video games is no easy feat, because ugly avatars are everywhere in the land of MMOs. Since you spend the majority of your time looking at the back of your avatar, an ugly face can sometimes be ignored. But over time I found myself groaning every time I logged into the game and saw my avatar’s ugly mug staring back at me. Nothing says 'medieval fantasy' like brown latex pants and sneakers. Next came my character’s clothing. I realize that it’s standard procedure in fantasy games for your character to begin her journey in rags and eventually become the MMO equivalent of Liberace. But I found the clothing in Alganon to be not only unattractive, but anachronistically distracting. The setting of the game is supposed to be psuedo-medieval, yet my character is wearing a brown latex wetsuit? Strike two. Finally, there was the poleaxe. Initially my character’s weapon was Velcro’ed across her back in the usual video game fashion. But after a particular patch was installed, my character suddenly found her poleaxe buried into the middle of her back. If this is a glitch, the developers have not been in a hurry to fix it. She’s looked this way for months. Strike three – you’re out. These are all relatively minor issues that other players may be able to overlook. But the Niggling Pixel Effect is different for each player, and the ugly faced, wetsuit-wearing, inappropriately-placed poleaxe carrying avatar became unplayable for me. What is your Niggling Pixel? This entry was posted by Leslee	on Monday, May 24th, 2010 at 7:00 am	and is filed under Avatars. 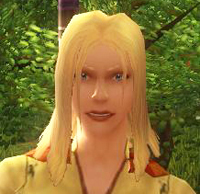 Any game where you’re playing as Aimee Mann can’t be all bad. Your scripted dialogue here completes the impression given by the avatar’s straight blond hair in the closeup image: Aimee cultivates an aura of the cool but often hapless loner. I play a warden in LoTRO wielding spear, javelin and shield and it has always bugged me that the spear and javelin on your back always clip through the shield on your arm. I don’t have anything interesting to add to this discussion. I just wanted to say keep doing what you do. Your posts are always awesome. I love WoW to death, but I can’t play Blood Elves, male Night Elves, or female Draenei without long cloaks. Blood elves have this twirly jump that I can’t stand, male night elves have a horrible, floppy, unattractive run, and female Draenei have these limp tails that look more like weird growths than a real appendage (thankfully, a long cloak covers them). Also, female Draenei twist their spines in a way when they run that looks like their back is broken, and it makes my lower back ache in sympathy. Also, far too many WoW races toss their heads back sharply when they jump (e.g. female Orcs), and all I can think is “whiplash, much?”. My personal itch is in City of Heroes. Specifically, the many ‘Armor’ type powersets don’t scale with the ‘Huge’ character type. Give a regular Male or Female character something like, say, Earth Armor, and they look like they’re actually covered in armor. Give it to a Huge character, and they get the exact same armor as the Male character, which means it clips through them and cuts through limbs and such. Also, when giving a character Wrapped Cloth-type shoes, and then having them run, a small horizontal strip of each foot will periodically turn invisible. Just disappear, essentially. A lot of my characters have this footwear, and this is driving me up the wall. Come to think of it, City of Heroes is littered with graphical glitches like that. For a game that’s essentially 50% character customization, this can be a jarring thing. Just wanted to say that I’m naturally blond and my eyebrows do, in fact, exactly match my hair. My eyelashes do, too. I’ve always found it rather unpleasant and I don’t know why someone would design an idealized avatar that way. Yikes.